Small Business Growth and Job Creation Depend Upon Solving the Climate Issues - Sapling Financial Consultants Inc. It is no secret that climate issues have a direct impact on small business performance. In fact, there are several climate implications which can impede a small business from growing and hiring new employees. This can be seen in an article published in July 2018 by The Climate Reality Project, which highlights the numerous ways that Canadian individuals and businesses are currently being affected by climate change. Some of them include: extreme weather, sea-level rising, and imperilled artic. All of these situations have caused immense property damage and have even taken people’s lives. As climate-related issues continue impacting businesses, insurance premiums are bound to keep increasing. Additionally, the pay policy for loss and the claims that they are willing to cover might also decrease. In fact, according to the Insurance Bureau of Canada, Canadian insurancers are currently facing higher claims than ever before. Claims for natural disasters have been estimated to approximately $1 billion annually (a 250% increase from previous years). An example of this is one of the largest insurance companies in the United States, Allstate, which since 2011, has already cancelled and decided not to renew insurance policies in several Gulf Coast states. Moreover, in 2017 they decided to strengthen their catastrophe response measures and their reinsurance policies. As climate issues keep occurring, uncertainty and productivity are both affected in the day to day operations of a business. For example, when employees are unable to work due to lack of transportation or electricity, business productivity drops. For small businesses who sometimes operate on a tight cash flow, this can significantly impact their future. Climate-related factors influence the pricing of millions of products and services. On many occasions, extreme climate can cause products/services to become scarce, very expensive or not available at all. Depending on the type of business, higher prices from suppliers can completely reshape the way the business operates. It can increase operating cost, lower revenue margins and also influence the pricing of the company’s goods & services to its customers. An example of this is the worldwide agricultural industry which constantly faces climate-related changes. In Canada for example, consumers were affected by the California droughts and wildfires, seeing how imported items became scarce and/or more expensive. In August of this year in the UK, BBC and the Centre for Economics and Business Research (CEBR) reported that food prices would increase up to 5% due to extreme weather. In certain cases of natural disasters or other extreme climate emergencies, governments are forced to step in and subside large amounts of expenses. These expenses on many occasions can down-funnel to higher taxes on individuals and corporations. Many organizations are working on business continuity plans for climate-related issues. They dedicate a large amount of time and resources to prevent major climate events from interfering with the business. Business continuity costs include potential: lack of water supply, information/data loss on servers, IT outages, fire plan & drills, electricity outage, among others. This is one of the most important climate-related implication for both individuals and businesses, as it relates to people’s health and wellbeing. In certain cases of extreme climate events, individual’s health might be affected. This subsequently impacts the way a small business operates as staff might not be able to perform their daily responsibilities in both the short and long term. The above are some of the different implications that climate-related issues have on small businesses. To make matters worse, many of these implications are widely known and constantly overlooked. The image at the top of the blog says it all. 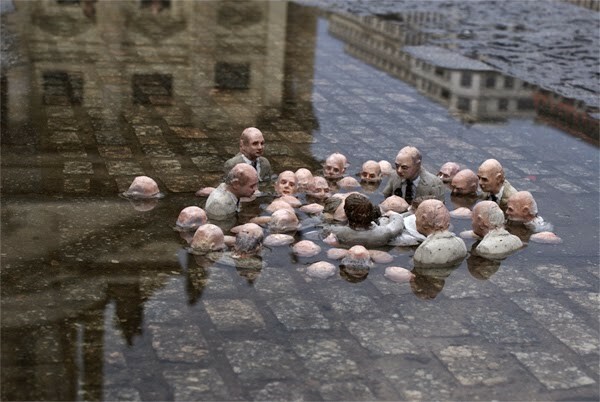 It is a sculpture by Spanish street artist Issac Cordal in Berlin and it went viral on social media with the headline “Politicians Discussing Global Warming”. If we don’t solve the climate issues, small businesses are going to continue facing these and many other problems; which makes it very difficult for them to grow and offer more job opportunities. In an upcoming blog, we will discuss different ways individuals and companies can contribute to lowering climate issues. Here we plan to address how we as individuals and companies can help, different actions that can be taken to solve certain problems and some best practices.